State of the art x-ray inspection systems help ensure product and package integrity by identifying contaminants, scanning for missing or broken products, detecting packing voids, confirming fill levels and controlling product and package mass and fat analysis. The entire Detectomer® family of products can be x-ray detected in use with packaging and product that includes glass, metal, stone, and high-density plastics, even for products packaged in foil or metallized film. Detectomer® products include Tri-Clamp gaskets, screens, orifice plates, o-rings, quad rings, cord, camlock gaskets/screens, rod, sheet, and scraper blades and are available in a wide variety of sizes and elastomers. The Detectomer® product line would like to welcome the Buna Bevel Seat gasket to the family of gaskets. 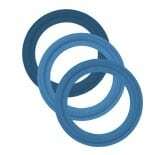 This bevel seat gasket is designed for use in the sanitary piping systems for the food, dairy and beverage industries.